New York was fascinating as always, despite being beastly hot. My favorite thing about New York is always tramping uptown and downtown, east side and west side. Unfortunately, since temps were in the high 90s, my tramping was focused on finding cool buildings for respite or walk-thrus. In my next tale, I visited friends in Connecticut and I finished up with a family wedding in Brooklyn in the neighborhood known as DUMBO (Down Under the Manhattan Bridge Overpass). First we’ll take Manhattan, as Leonard Cohen sang (or sort of sang). The highlight was my visit to the Metropolitan Museum of Art and its special exhibit on Punk: Chaos to Couture, which runs until August 14. I also saw two very good plays – one at Irish Repertory in Chelsea, my regular favorite New York theater, and the other a Richard Greenberg drama on Broadway. Punk: Chaos to Couture was the Met’s 2013 Costume Institute exhibition and it celebrates both the look that punk musicians adopted in the 1970s in the UK and the US and the impact it had on couture (meaning clothes-not-going-to-be-worn-by-the-average-woman). Original punk clothing was shown, especially that worn by some performers and some designed by Vivienne Westwood for her London punk boutique. Couture by name designers of that period and later decades is also shown. The exhibit was visually and aurally appropriate with period music and videos. The DIY (do-it-yourself) nature of the punk scene was celebrated in the organization of the exhibit. The section DIY Hardware displayed the use of safety pins and metal ball chains in both punk and couture looks. DIY Bricolage used trash materials in costuming. Here we had the use of bottle tops, plate shards, plastic shopping bags and Tyvek envelopes to create wearable garments. Best of all, black trash bags were shredded or chopped to make glamorous gowns. Really. They were couture and I would wear one of them. Most of the couture seemed fakey to me, especially that from the last two decades. The use of safety pins or other metal and shredded and torn fabric doesn’t make sense outside of its musical context. Gibraltar. 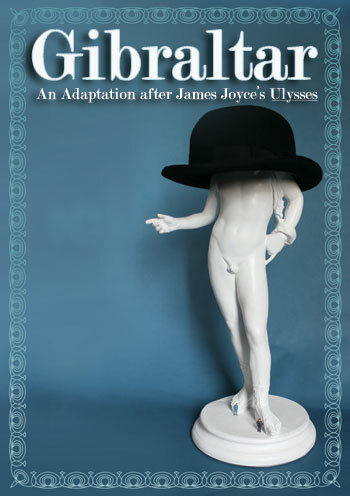 At Irish Rep, the two-character play Gibraltar, “an adaptation after James Joyce’s Ulysses,” was being presented in its tiny basement studio. I felt like I was at home in a Chicago storefront venue. The play was written and performed by Patrick Fitzgerald, along with Cara Seymour as Molly Bloom, and directed by Terry Kinney, one of the Steppenwolf founders. It’s beautifully done, retaining Joyce’s language, and leading us through many of Leopold Bloom’s errands and encounters on Bloomsday. (I was a month or so late for Bloomsday.) It ends with Molly’s monologue, usually called the Eight Beatitudes. Beautiful lighting and sound design make this scene magical. The Assembled Parties by Richard Greenberg is a family affair set in a large old Central Park West apartment in two acts on two Christmas Days, 1980 and 2000. Judith Light and Jessica Hecht give fine performances as sisters-in-law in a family in decline. The dialogue is charming, funny and vivid and we glory in their lives in act one and grieve for them in act two. It’s a terrific play. (Greenberg also wrote Take Me Out, The Violet Hour and Three Days of Rain.) The revolving set displays five rooms of the apartment, designed as only Santo LoQuasto can furnish a room. Stamford was a short visit, punctuated by shopping (I learned that Stew Leonard’s is a destination, not a supermarket), eating, visiting, exploring Stamford and Greenwich, and going to a movie. We saw The Way Way Back with Steve Carell and Toni Collette. Carell is Collette’s obnoxious boyfriend, a character you love to hate. The movie is funny and sweet, one of those coming-of-age stories about the Collette character’s 14-year-old son. Sam Rockwell (remember him in Seven Psychopaths? ), a very talented actor, manages to give it an edge and keep it from lapsing over into sentimentality. His performance is the treat of the movie. Short story. Family wedding at a lovely old temple with a lively reception in DUMBO. The bride and groom were darling and it was nice to see friends and relatives. Just before we reached the reception, we passed an intersection that offered a fabulous view of the bridges (Brooklyn and Manhattan) and we walked back to take lots of photos. 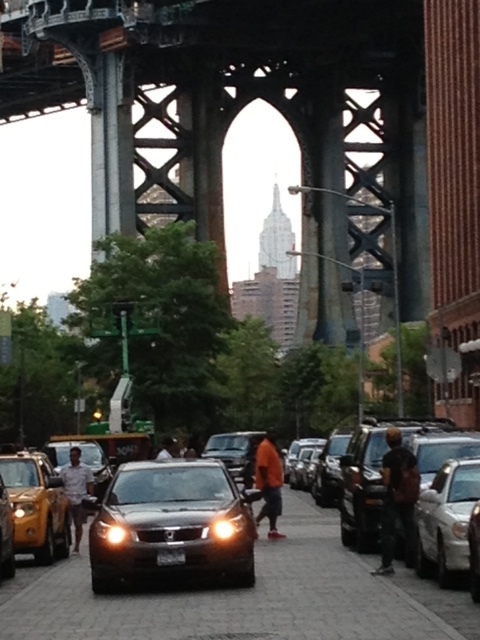 I took this one with the Empire State Building playing a cameo in the distance. Lovely! I will be there next month! Sounds like a busy but nice vacation. That’s too bad that you were there during the only heat wave this summer. Neat picture. And question… is New York your 2nd favorite city after Chicago? I’d have to view that you live all the theatre options there! You are right! I love New York (and London, Boston and San Francisco) but Chicago will always be my favorite city. The amount and quality of theater here is amazing.